It’s 8 o’clock, and time for Fred to go to bed. He, not unsurprisingly, has other ideas. Published in 2013, this is one of those books that is worth having as a work of art if nothing else, but it also has a funny and engaging narrative. The incorrigible Fred tries all manner of delaying tactics to avoid bedtime but ultimately gives in. What lifts Yasmeem Ismail’s story though is that it’s written as one half of a dialogue; the other participant being a silent (and unco-operative) Fred. That’s not your bed, Fred! Oh Fred, that’s MY bed! The repetition and the rhyme will have young listeners in fits of giggles, intensified by the scruffy illustrations of the disobedient hound. Reading this in a voice of increasing mock-irritation is great fun and although simple enough, children of a variety of ages would enjoy it. For the very young there is plenty of language practice to be had discussing all the things that Fred does instead of going to bed. Excellent for toddlers and pre-schoolers and good for less confident young readers to read themselves. 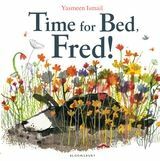 A fun bedtime story if you trust your child not to emulate Fred’s behaviour!